With bilingual children in particular, how we read a story out loud is essential. It can be the bridge that a child needs to truly understand the storyline and to pick up key vocabulary. Just because a story is in a target language doesn’t mean that children will understand it or enjoy listening to it. It is our job to bring the story to life through different voices, varied intonation and changes in speed. Even a slow, calm story can be read in such a way to help children become captivated. When choosing bilingual books for bilingual children, it is important to think about the presentation ahead of time. Does the story capture your attention? Can you envision yourself becoming each of the characters for the duration of the story? Will you be able to read the book out loud in a way that your young listeners will be interested? It is important to note that if you don’t like the book yourself, it will be very difficult to read it in an engaging way for your listeners. The nice thing about bilingual books is that they often lend themselves to being read out loud. The stories are often chosen because they have been shown to captivate a young audience of listeners. On the right side of this blog you will find a short list of some recommended titles, such as The Very Hungry Caterpillar, The Goose that Laid the Golden Egg, Brown Bear Brown Bear What Do You See?, and Farmer Duck. You also may enjoy reading through the bilingual book reviews that are published on this blog. They will give you a great view into some of our favorite books. Stay tuned for more each month! Create a comfortable location. When you read books out loud to children, do it in a special place that is comfortable and cozy. This could be a cozy corner of your living room or classroom. Or maybe in the middle of the room but with big pillows and bean bags. If you can, have enough soft blankets and even stuffed animals so that children can snuggle with them while listening. Pick a book that you like. If you don’t like the book you are reading, your children will most likely notice this. Pick books that captivate your interest and that have characters that you’d enjoy “being.” If you are looking for some suggestions, feel free to contact Language Lizard to help you find just the right books for your needs. Use props and costumes. There isn’t any need to go over the top, but see what you can find to help act out the story: a scarf, hat, funny shoes, puppet, wand. The touch of the wand on a child’s head at key moments of the story can really make a difference. 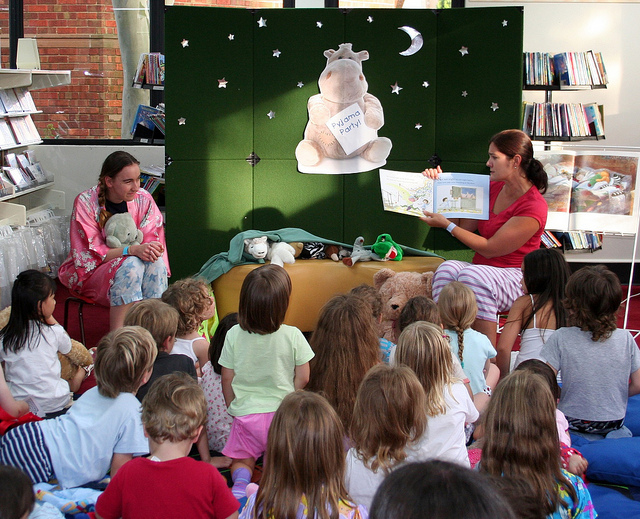 Reading the story out loud or discussing the story with a puppet on your hand can be hilarious fun! You might want to consider having a special hat that you put on when it is story time so that children will know what time it is. Use expression. Use expression when reading out loud. Use different sounds for the characters, use a loud and fast voice when the story gets exciting, use a soft and slow voice when the story is suspenseful or sad. Stories with dialog are easiest for this, but even ones without dialog can be captivating if you keep the story varied with your expressions. Leave them wanting more. If you are reading a chapter book out loud, make sure to finish on a suspenseful chapter that leaves your children looking forward to tomorrow’s story time. If there is a cliffhanger in the middle of the story, stop and look at each of the children with wide, excited eyes until they call out asking you to continue. Notice which books make your children look forward to story time and see if you can find more like them. Whether your children or students can understand every word you are reading or not, how you read your favorite bilingual books out loud will make all of the difference. Later when your children or students read the story to themselves, they will be filled with memories of how you read it out loud to them. What a wonderful gift you will have given them! For teachers and librarians: Pick out bilingual books to read out loud with bilingual children. This way your bilingual students can take the books home and have their parents read the story out loud in their language. Encourage parents at home to read the story with as much expression as well (give them the tips above). It won’t take long to get a daily story time rhythm going. Before you know it everyone will be looking forward to story time. It will quickly become the most enjoyable time of the day for you and your children or students. How do you read books out loud to your children/students? Are there any special techniques that you can recommend? What are your favorite books to read out loud?